Sales compensation is always tricky… Most folks that haven’t “carried a bag” (vernacular for being in sales and carrying a quota) aren’t aware of the high risk, high reward nature of sales compensation plans. We recently updated our comp plans and I thought I’d share the datapoints that I gathered. 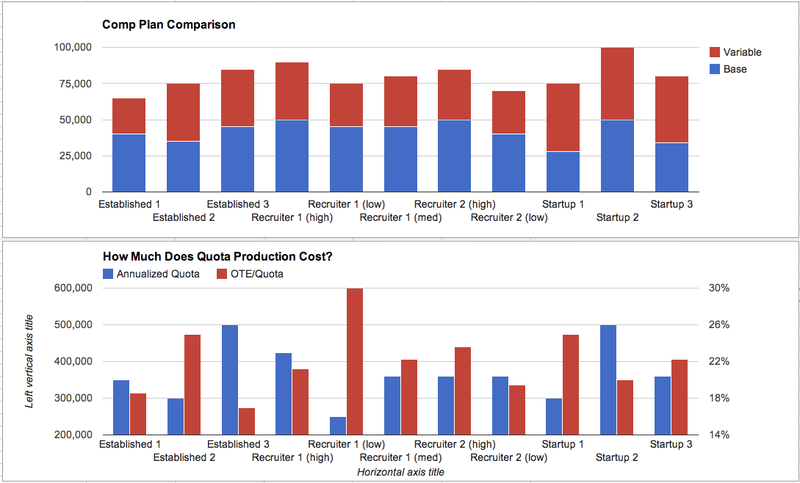 Quota – What is the rep responsible for bringing in to the company in new revenue? Base – What does the rep get for showing up? Variable – What commission do they earn for hitting quota? OTE – On Target Earnings – Easy… this is simply base + variable. This is also a confusing number since people who don’t live on a comp plan assume that this is what sales reps make. They don’t. A third of your reps will make or exceed quota. Another third will bobble around it. The last third will feel the heat and will move on or be moved on. (Hence the high risk, high reward nature of sales compensation). Efficiency – This is a measure of what percent of new revenue you are paying out in quota to get the new revenue. Recruiters play to established firms (who can pay the commissions required for head hunting) and they reported in numbers that looked more like the established firms. What are your thoughts on sales compensation plans? If you’d like to offer additional data points to help flesh this out, I will add them anonymously. Just reach out to me directly. ExactTarget (ET) is currently on a tear. Founded in 2000, they raised $75M on the way to going public in April of this year, and have already made $115M+ worth of acquisitions (Pardot for $95M, and iGoDigital for $21M). As of this post, they have $1.5B market cap and rumors of buyouts from SAP, Oracle, Salesforce.com and Microsoft (Bloomberg article). ExactTarget serves as an interesting SaaS model in the interactive marketing space, and one that many SaaS startups (Windsor Circle included) can learn from. In this post, I’d like to explore how quickly ExactTarget grew, its gross profits as it did so, and the amount spent on various functions in the business. For the past 4 years of reported financial data, ExactTarget has consistently reported 33%-34% CoR. Raw data can be seen here. ExactTarget’s subscription revenue has been shifting a bit. In 2009, 87% of its revenue was from software subscriptions. For the 6 months ending June 30, 2012, it was 80%. On average, looks to be about 84%. Management notes in the S1 show this as them going up market and needing to handle more professional services on behalf of larger clients. On average, the Cost of Revenue (CoR) for the SaaS software revenue is about 23%. Professional Services Revenue Averages 16%, Cost of Revenue Averages 89%. The inverse of the revenue model is obvious. What you’re not making in software revenue falls to professional services. But the interesting thing here is the CoR… They only make about 11% gross margin on this. It’d appear that they are basically covering their costs of professional services, showing that this is an enablement play to ensure that their customers are getting enough value from full usage of the software to stick around year after year. I’ll dig a bit deeper into amounts spent in each function in the following post.